We know the end of the year brings one too many to-dos to bring your nonprofit into next year. However, in order to move forward effectively, you also need to look back. This is especially true for your website. Don’t waste another dime promoting it, adding content or even having it up if you aren’t going to take time to understand it. 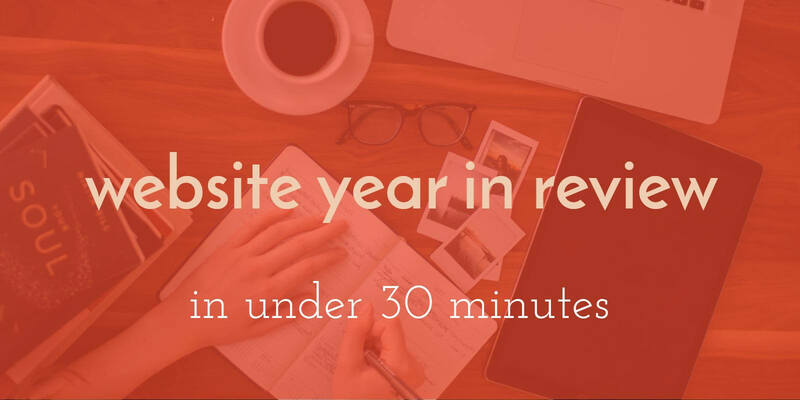 To avoid leaving your site in the dust here’s a way to conduct a nonprofit website year-end report in less than 30 minutes. For most nonprofits, you can understand your site’s overall health by combining just a few areas of Google Analytics metrics. This includes how your traffic got to your site and what they did when they got there. Look for major trends like high pageviews, low bounce rates, spikes in traffic according to the graph. Compare these trends to your efforts – what did you do that may have contributed to spikes, high traffic and/or people staying on the site? Compare these trends to your results – did spikes in traffic lead to higher donations? Did the pages with the most views turn into signups or did people drop off after getting to that page? Finally, go to the date section again and select “compare to” and put in the same dates but one year previous. Look for overall trends again and see if there are specific things you changed this year that paid off. Also, take notes of areas where you performed well last year and have those serve as a reminder of what to try again. To understand where you’re losing potential donations or signups, you need to know where people exited your site. Instead, pay close attention to landing pages, pages with forms, highly promoted blog posts and your contact page. Anywhere you put extra effort into bringing people to matter most here. If these rates are high, you’ll want to revisit them to ensure the user experience is good and people are finding what they’re looking for. If they don’t and they keep exiting quickly, it’s really hard on your SEO. Each year, mobile traffic becomes more vital to your website’s success. Go to the Audience tab on the left side of your Analytics page, click on Mobile, and select Overview. Compare your desktop to mobile traffic and note the differences. If your mobile traffic is performing far worse on metrics like bounce rates and time on page, it’s likely time for you to consider a redesign or at least conduct a mobile site audit. Finally, check out Channels to understand one of the most important aspects of your site: how people got there. In your Aquisition tab, go to Overview and then All Traffic to find Channels. Look for the channel with highest engagement metrics and consider investing more of your resources there for next years promotional efforts. Now that you’ve taken in all this data, do your best to apply at least a few of your learnings by coming up with an actionable plan. If you’d like some help with a website audit or even just a consultation, reach out to us at ArcStone.